After some teasing about a possible Subaru BRZ STI—perhaps even the hopped up, turbocharged BRZ everyone has been asking for—the automaker has officially confirmed U.S. spec version of the BRZ tS on Twitter. It might just be one of the best handling cars for the money, but forget the turbo. 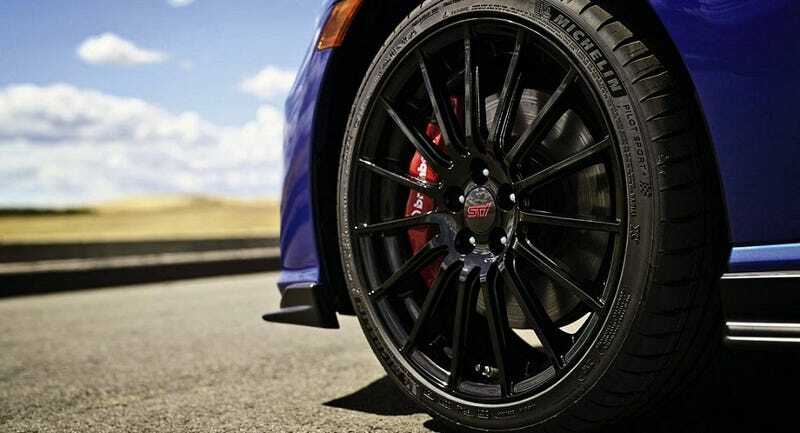 The most recent teaser image of the car shows lightweight STI wheels, Michelin Pilot Sport Tires, Brembo brakes, and an upgraded aero package paired with the hashtag #BRZts. This (somewhat unfortunately) solidified our theory that the upgraded BRZ will not be a turbo monster but rather a U.S. version of the car that debuted in Japan a few years ago. Think of it as the BRZ’s take on the Porsche Cayman GT4—better handling, but less of an emphasis on power. Subaru will unveil the full details sometime today, but the Japanese spec car was designed with more “agile handling pleasure” which means the BRZ tS might be the best way to dominate your local autocross or tackle your favorite mountain road without blowing your life savings. Just don’t expect WRX levels of power. Hopefully we can all live with that.